Dr. Patil earned a Ph.D. in Biomedical Engineering from Vanderbilt University in Nashville, TN, where he also served as a post doctoral research fellow in the Center for Biomedical Optics. 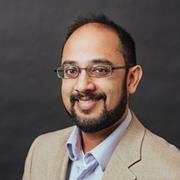 Prior to joining Temple University, Dr. Patil was a Research Assistant Professor in the Department of Biomedical Engineering at Vanderbilt University. His research is focused on the development of label-free, biochemically specific, optical imaging and spectroscopy techniques for screening and diagnosis of disease, intra-operative surgical guidance, and applications to priority issues in global health. Dr. Patil’s work has been included in journals such as Optics Letters, Journal of Biomedical Optics, and Optics Express.